Sitting in a delightful January day with a coffee, in one of the few surprisingly quiet areas in Rome, while having a chat with guitarist Francesco Diodati, you might easily forget he’s just releasing a new album. Because you don’t even notice time is passing, while the conversation spans from Pierre Boulez to Steve Coleman, moving through contemporary art, deduction in the scientific research and sociological interpretations of the meaning of ‘youth’. And you might have lost why you were there while enjoying the pleasant chat. This is how it went our chat: yet, we discussed about the music in his latest recording, released under the name of Francesco Diodati Yellow Squeeds and entitled Never the Same, in every single moment, even when apparently off the table. There was always a red thread moving unseen through the words, which Francesco hinted when discussing about a documentary about CERN, the physics laboratory in Geneve. Science might go hand in hand with the intuitive beauty of art, as Diodati perfectly summarizes with the words those formulas which are correct, they have a mark of beauty in them. Researching might go together with writing music, he says and his music says. Recognized as an experienced guitarist in the Italian scene with more than ten years experience, Francesco Diodati garnered an important reputation after the collaborations with renowed players and a bunch of highly exploratory albums at his own name. He has been linked with Italian trumpeter Enrico Rava, who joined since 2013, released an ECM album with and whose quartet is still playing with. He worked with Bobby Previte as well -notably they released the post-rock influenced Plutino together with saxophonist Beppe Scardino-, drummer Jim Black, trumpeter Paolo Fresu, trombonist Gianluca Petrella among the others. His investigative and boundary breaking guitar sound made of frequent clean or raw sounds, feedback and effects, post-rock arpeggios together with twisting Monk-influenced melodies have guaranteed him five straight wins by Jazzit magazine readers’ polls. He’s now releasing the second album together with Yellow Squeeds line-up, whose music he is main composer of, and they have all been published by Italian explorartory jazz label Auand. A quintet, yet not a quintet in the standard sense of the word, featuring trumpter Francesco Lento, Enrico Zanisi at piano and keyboards and Enrico Morello -fellow player also in Enrico Rava‘s quartet- at drums. The line-up is bass-less and it’s pivoting around the tuba sound provided by Glauco Benedetti: I met Glauco while recording with singer Ada Montellanico some time ago. He was playing tuba on that recording. Then I happened to listen to bands with sousaphone in New York. I liked tuba, it created a totally different sound to mix with the acoustic piano. I liked the idea of managing elements of unexpectedness in my band. I did not have a specific band as reference, a precise source to take inspiration from. Of course some bands came to my mind, like Henry Threadgill who used tuba a lot, Liberty Ellmann used tuba, but I did not borrow my idea from them. Henry Threadgill‘s Very Very Circus and Zooid, with their typical twisting and exploding burts, are the closest references to Yellow Squeeds, including Bill Frisell‘s line-up heard on the classic Rambler -the american guitarist deeply nourished Diodati‘s playing. And multiple line-ups centered around tuba are drawing attention nowadays, notably Shabaka Hutchings‘s Sons of Kemet and Daniel Herskedal. Yet none is similar to them: Yellow Squeeds display a unique sense of humor, playfulness, aggressive sounds mixed with refined arrangements and polyrhytmic journeys. I care a lot about the kind of research I did on this work. Before writing something or thinking about how playing it, I studied polyrhythms for two years, until I was so accustomed with it to feel it literally inside my hands. Searching and learning are kind of recurring words in Diodati‘s vision. Whether we are speaking about how Pierre Boulez was influenced by what Paul Klee‘s wrote about his own deduction process or what Francesco learnt while playing in Myanmar -he has travelled frequently to the country as part of him joining Mynmar meets Europe project-, still he is focused on music as an act of learning. In the information age it might be easy to think learning ends when we found data we were looking for; yet we are missing an additional stage, which is developing an inner consciousness about what we’ve learnt. This is actually well-know in training industry -take a look at the Conscious Competent Ladder. When we learn by progressive additions of information, we will reach a stage where we are conscious of the skill we learnt. We know what we are capable of. Yet, the very final stage is becoming unconsciously skilled, which means being able to do something without really understanding why we can, because it seems to easy. (Try to reflect on exactly the movements you make while you are doing something you learnt in your childhood). Francesco Diodati is very aware of what it takes to reach that very final stage and how to do that from a musician’s perspective. Simple Lights, the middle of nine tracks on this album, is a declaratory example of how this process works for him: I studied dynamic polyrhythms with Miles Okazaki, something he had practiced with Steve Coleman. I took a note about and then I kept it unused for years. Then I found it again in 2015 and studied it for the subsequent two years. At the end of this process, I was finally able to apply the concept in one of the tracks in this new recording. What happened then is Diodati made that example a generative source for exploring and creating what then become Simple Lights. Stimulating curiosity, nourishing it with a wide array of inputs, even outside of music, this can trigger a multiplying approach. Something similar to what Boulez said about how painter Paul Klee conceived deduction as a tree of consequences. Whenever I start from a rule and I plan to do things in advance in a certain way –says the guitarist, it doesn’t work. I need to practice, to do a reasearch in the field, not just theorizing it. Something pushes me to get more in deep. And when I’m really into something, I am able to expand it. Maybe that’s the research: change and expansion. Starting from a snakeing slide guitar and a singing melody over an afrobeat rhythm, Simple Lights not only inflames the expert and polyinstrumental playing provided by drummer Enrico Morello, yet elicits the powerful underlying bounces by Benedetti and the swinging additions by Lento. Steve Coleman is the ghost in town in this playful, dancing and intense track. Yet Diodati explores a different way to build its own rhythmic additions, differently than the master. When Enrico Zanisi adds his cubanesque piano in the higher layer imposed over a binary-against-ternary pattern, the ambiguity becomes crazy and confusing, until the delicious caribbean duo by Lento and Benedetti, occasionally at trombone. Yet the body can’t stop dancing, even if the clever modulations move through chromatic steps and keep a sense of weird melodic development. Through constant additions of rhythmic patterns, the track creates a unique sense of moving that is funny and aggressive at once. Diodati explains how he is interacting with the rest of the band: I like to show directions to the musicians I play with, but ultimately they are welcomed to endorse them in their very own way. I don’t like a musician playing by the script. This bothers me a lot, it doesn’t sound like music. Music is a living thing. Even if it’s overwritten, the score must aim at letting people be able to put themselves in. I really care about it in each band I am owner of or I am bringing my own vision of music in. 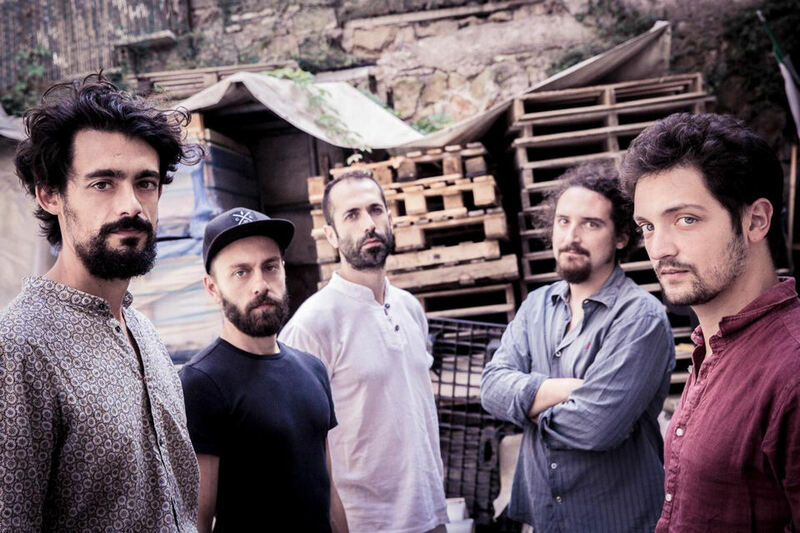 Premiered during a tour that went through London, Milan’s JAZZMI festival, Amsterdam’s Bimhuis and an usual location for them, Rome’s Casa del Jazz, Never the Same showed how improved their sound grew at the release of their sophomore effort. The quartet shows a tighter connection, a deeper sense of interaction that lets no time to take a breath. Simple Lights is a perfect example of this work in progress, as Diodati explains: that track shows how the band dynamics evolved. Some rhythms overlap on each other, then the track progresses and the shifting beats are apparently pushing things we listened before back in the surface. It’s like turning over an object and seeing it from a different perspective, spotting a color you had not seen before. This allows me to research, even in action during a live setting, because we never expect to play the same time as we did before. The purpose of my writing is to achieve things like this. Just playing according to the score is not enough. The opening Here and There is divided in two parts, the first centered around a funky riff interacting with a rhythmic line swaying and ondulating through binary and ternary rhythmic patterns. Lento‘s trumpet plays a juicy riff mainly in unison with Diodati, with the guitarist at times stopping on oddly centered start and stops that are remindful of both Tigran Hamasyan odd-meters and of Meshuggah hard edged riffs. The guitarist has a deep taste for extended melodies and places them often over long chord progressions and intricate rhythmic patterns: still they are always catchy and he never fails to lose the sense of melodic development. Here and There‘s second theme starting at approx. four minutes is overstrucured as well as the initial theme: while in the first part tuba, piano and drums seemed to be in background, they slowly emerge powerful and intense with a math-rock flavor. Francesco Diodati indicates how he wrote it: the second part of the track is based on polyrhythmic layers. A cloud of rhythm is placed over a basic pulse, it is like the throttle moves up and down. Removing the underlying pulse and leaving only the polyrhythm would result in time accelerating and decelerating. Both the two-beats and three-beat pulses are written according to polyrhythmic patterns. When I write the polyrhythmic layers in this way, I might place the stroke on five sixteenths or five eights groupings. You just feel a sort of time slowing down, if you remove the pulse. But ultimately it accelerates in a way related to a different pulse, placed on the underlying layer. I am interested in playing on one beat or the other as to create a sense of ambiguity in the song. There are hints at post-rock or electronic influences in the rhythmic and tone debaucheries Yellow Squeeds put in place. Diodati frequently makes use of tones rich of feedback, additions of soft fuzzes to his clean sound, which is often very raw in Never the Same: I increasingly explored this style of sound lately -the guitarist says. I chose a Fender Jaguar, which has a raw sound, a surf music guitar with an harsh style. It’s very risky to play with this kind of sound, because it’s so different than that typical mid frequencies oriented jazzy sound. […] At one point I felt the need to remove everything and just feel the string, listening to the instrument attack, being able to feel the imperfection of the note. And then starting back building my own sound from that. I usually add fuzz, delay on it. Those effect are part of a basic sound, a very earthy sound. Nonetheless, Francesco Diodati‘s style pays a due to players such as Jim Hall and Bill Frisell. The latter, widely known for his open airy style chords, is inspiring his playing also from a rhythmic exploration point of view: [Frisell] manages polyphony in a very peculiar way, yet he explored rhythmic side in a very interesting manner. Even if this is not the first he is usually linked with, just because he has this amazing airy, expanded sound. Yet, he is incredibly clever in his rhythmic choices. When it comes to speak about influences, the short interlude Blue Dreams unfolds how much he was exposed and studied with one of the most underrated guitarist around, Marc Ducret. An intricate and oblique solo on acoustic, that from a certain point of view marks a break in the rhythmic craziness of the album. Still the lesson from the master is learnt at a deeper and unconscious level, speaking the language of training formulas, as Diodati shows how to bend Ducret‘s style in his own playing with a mark of authenticity. When talking about lessons learned from Marc Ducret -he was accidentally coming off a conversation with the french guitarist just few days before our chat- and, again, Steve Coleman, he makes clearer how his own writing process works: Lennie Tristano and Stravinsky were sources of inspiration for Marc Ducret. […] I remember a conversation I had with Steve Coleman. I asked him about how he developed a pattern. He told me that he did nothing, but taking the music of Charle Parker and Thelonius Monk, going in there and expanding the concepts that were already kept into their music. Listening to Monk you realize that, even in those tracks moving according to a four against four beat, yet they are based on polyrhythmic patterns. Even if you dig into the more popular themes created by Monk, you’ll discover a world ready to be expanded, as Coleman did. Marc Ducret does something similar when drawing inspiration from Stravinsky or Tristano. Irrational Numbers perfectly delivers the sense of this expanding concept. Piano’s ethnic flavored intro is answered by a tonally ambiguous counterpoint by guitar -again an hint at Ducret is just behind the curtain. An hidden rhythmic pattern drives the track and trumpet together with drums add a new layer. And finally that same pattern comes back some bars away, now with just part of the former notes. Through an engrossing crescendo, Diodati adds crunchy chords and vigorous lead guitar breaks rich of feedback, Zanisi displays fast-breaking lines while the others travel seamlessly through the multiple layers of rhythms like an expanding and exploding supernova. After around three minutes and fifty seconds the full band is now able to release a full force blowing-away riff at the pinnacle of the tension. If Irrational Numbers is one of the most dynamic efforts of the album, then the title track starts with a more reflective mood. Over a tonally swifting and rhytmically sparse accompaniement by Enrico Zanisi‘s piano that reminds a sort of Radiohead‘s Pyramid Song sense of eerie stasis, Francesco Diodati places occasional notes until the lyrical entrance by Francesco Lento. The guitarist tells more about Never the Same came from: I turned the recorder on, I played and then I transcribed it. I just wanted not to worry about a specific metric or rhythmic beat, just playing the chords as long as I liked to. And this is what came out. It was initially a very different song. It was the hardest track to record in studio, we haven’t played it live yet. The first part, with that chord progression moving beneath the surface and we improvising over it in a very minimalistic manner, was initially different. It was all rhythmic and very precise. But we played it and I did not like it. I slowly nurtured the idea of trying it this way just before recording it with the band. Since the entrance of an elusive cymbal beat, the rhythmic pattern becomes clearer until a break at around three minutes. The second part retains same rhythmic contrasts, yet propelled by a rhythmically clever solo by Enrico Zanisi at synths until an intricated closing theme.There a specific rhythm driving this song, but it’s not really clear. Enrico Zanisi plays an ostinato on the bass register. It is beautiful because everything is just alluded, there is this flowing magma with a deep rhythm thsat gradually evolves. The idea for final theme came later, when I got back on that piece. I wrote it two years ago. I had not planned to record it for this line-up. A few months before the record I totally modified it and then we recorded it. Dancing, sleek and eye-catching, the tuba intro by Benedetti in Cities (formerly named after the city of Ferrara) shows how Yellow Squeeds managed a balance between ironical and more clever arrangements -see the odd-metered funky melody by Lento. I like working in band whose sound needs to be created from scratch -says Diodati. Sometimes it’s a fight. In this case I should not be creating something that works with double bass, we have to create, instead, for tuba. We need to keep in mind that tuba does not have the same attack double bass has. This is interesting to me, because it pushes me to write in a way that I would usually not. That’s research as well! The rhythmic sections morphs into an aggressive garage rock while trumpet and guitar joyously dialogue. Dancing on the stage, I want to get up there –says Diodati, a time when I am not concerned about performing something in a fixed way. It needs to go step by step down to a route to reach towards this. You should be wanting to do this thing like nothing else, which also allows you to eventually stop playing, to play silence. It often happens to me lately to step aside, to let the band play, to feel like it is to listen to them and then to come back, in a very harsh manner. We play like this with Francesco Lento very often: sometimes Francesco comes back in even if my solo is not over and his solo has not started yet. I like this, because it is like reaching a stage when we are free together, yet with a deep sense of awareness. Yellow Squeeds are shifting ahead their level of interaction, with an unique voice between those bands reinventing post-rock influences within jazz realm, bringing innovation at harmonic and rhythmic level. The band shows a deeper level of interaction, yet retaining the different sides of the musicians: I am looking for putting myself in a state of listening to the others – he says. I no longer have the need to express myself and to make evidence I need to protect my own ground. Being open to others is like playing a game, a risky game of course, because it depends on whom you play with. If the musicians do not accept those rules, if I sense someone is side stepping, I’m going to bother, to trigger a reaction from that musician. That’s what I want from those I play with. It’s something that I feel more important now than in the past. It is part of the beauty of playing. The audience can feel the difference when that kind of energy is created. Francesco Diodati is genuinely putting the research within his music, disguising it over a layer of singing melodies, groovy riffs and sharping guitar strummings. He is currently focused on multiple adventures: playing with Enrico Rava, soon in an extended line-up that will include pianist Giovanni Guidi and trombonist Gianluca Petrella; writing lyrics and songs for his Blackline trio with drummer Stefano Tamborrino and singer Leila Martial; playing with Floors trio with bassist Francesco Ponticelli and trombonist Filippo Vignato; hailing the 10 years annyversary of MAT trio, together with saxophonist Marcello Alluli and drummer Ermanno Baron; joining again Matteo Bortone’s Travellers band. And there are also projects involving dancers, visual artists on the horizon. Research is something that includes everything. Researching means watching a move, reading a book, playing guitar. Even if I was not a musician, I would be still researching. Research means having a dinner out with a friend. Research means falling in love!